Thoughts from Ray Land’s threshold concepts and troublesome knowledge. Having seen Ray Land on numerous occasions, I am really interested in seeing how he connects with staff at UCS. I think there are many opportunities to re-think our curriculum within a threshold concept model. I also think there are many opportunities where learning technology can help facilitate and monitor students journey through troublesome knowledge and threshold concepts. So, here we go …. In all disciplines there are threshold concepts, which if the he student grasps / breaks through will be able to enter a new conceptual terrain. As an ex-lecturer it can be interesting to try to identifying what are the threshold concepts within our disciplines. (The photo raises some of the questions we should reflect on). 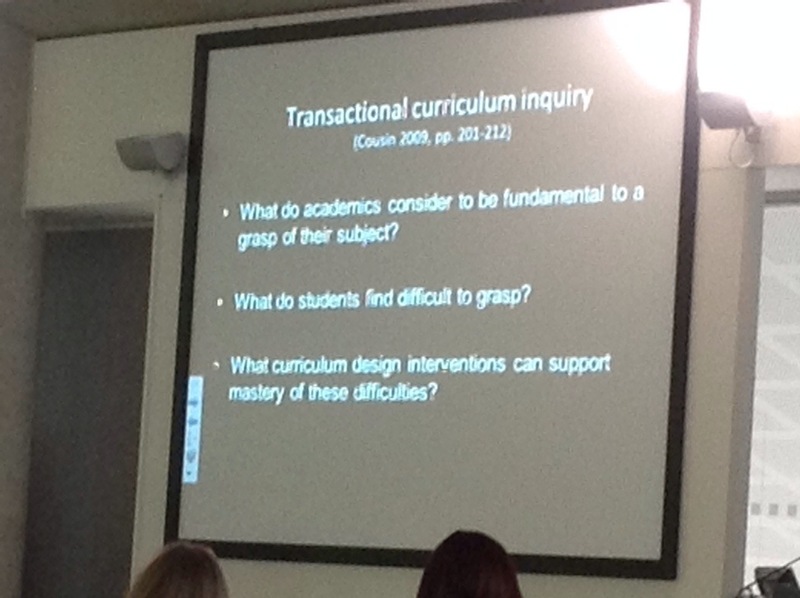 Liminality and breaking through troublesome knowledge is very unsettling, learners will need to negotiate this space. Interesting thought, we (lecturers) design the curriculum, so if students don’t get it until year 2 or 3, then surely something is wrong with the curriculum design in the first year? I wonder how joined up programmes are around identifying and building on threshold concepts through the levels. How detailed are those discussions? Or perhaps to gradual with semester and chunked learning. These are the emerging notes from the first keynote at UCS Learning and Teaching Day. Note these aren’t a thoughtful reflection, these are much more reactive. Explore the possibilities of changing pedagogical spaces. It will be argued the shifting landscape is will bring both challenges and opportunities for all stakeholders with the process. What might this mean to me? Concept of Pedagogical stratification being driven by marketisation (neo-liberalism) and league tables. This will give opportunities for widening participation, with increasing access but also challenges around developing success within these student cohorts. There does seem to be a need within our learning model to challenge the outsider / lack if self worth within student identities within the classroom. Ae we developing widening participation students to succeed in HE. I am thinking around classroom technologies, to reduce the sense of them and us. Transformative pedagogies, requires sophisticated levels of understanding on the part of the teacher and the operation of power in the classroom. So they need to take on the design on safe learning spaces which challenge all but minimise the fear of making mistakes. It does raise questions we might consider within Learning Services at UCS, about how study skills courses and support might be packaged and marketed to students to minimise a sense of reinforcing the sense of outsider within some of our students. So, where next? There needs to be a sense of this within the new PGCHEP, ie,, creating safe and challenging learning activities. Also, how might technology facilitate these designs, but not leading them. A shame the keynote didn’t shift from the theoretical to the practical. That always helps me connect with the ideas.